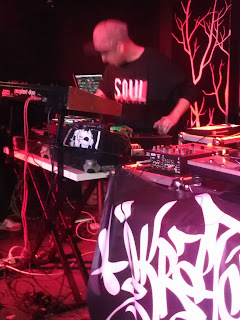 NEWS AND THOUGHTS ON TURNTABLISM / SCRATCHING / MUSIC / HIP HOP, AND MORE FROM [THE AMERICAN!] 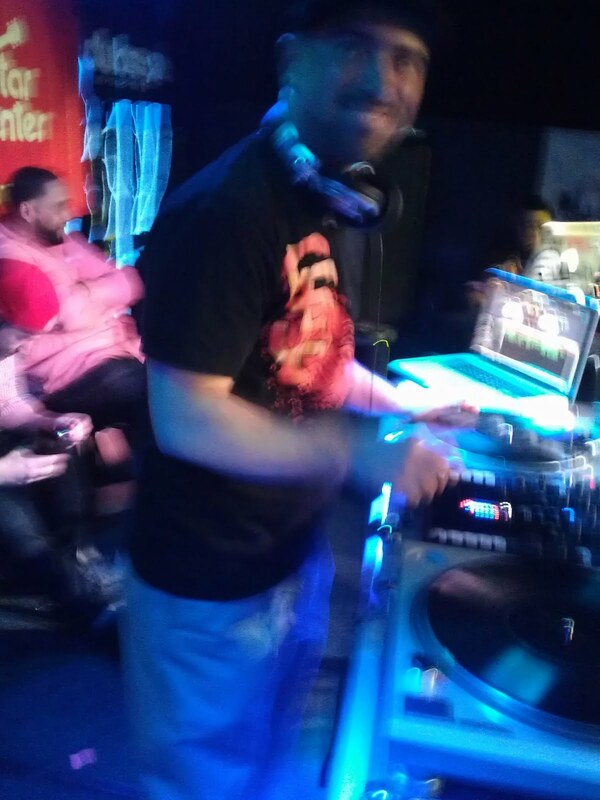 DJ PONE, FORMER TRANSPLANTS TOUR DJ, DMC BATTLE DJ, 89 SKRATCH GANGSTA, SCRATCHING INSTRUCTOR, AND CANNED BEATS CO-FOUNDER. 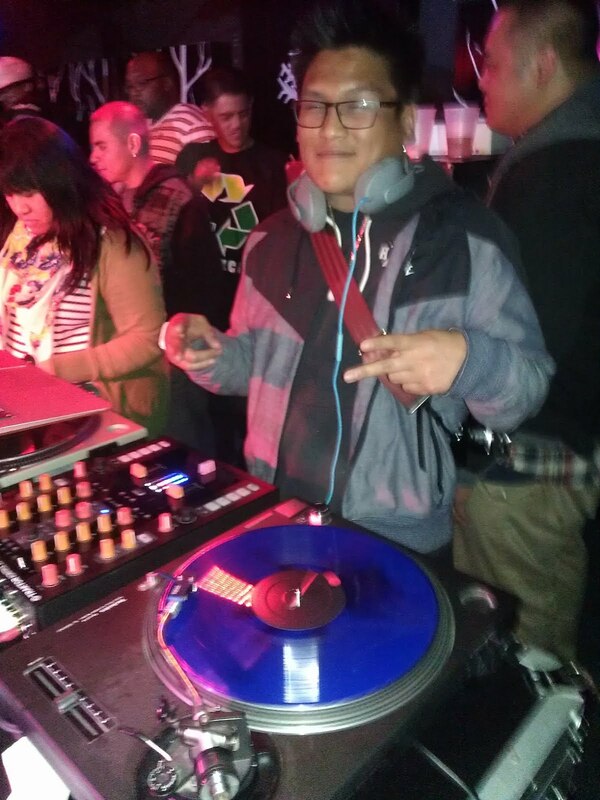 What's up y'all, I'll be spinning with DJ Mista-B, Mike Boo, Benny Flan, Max Kane, and DJ Cue at Pissed Off Pete's in the Mission in San Francisco. 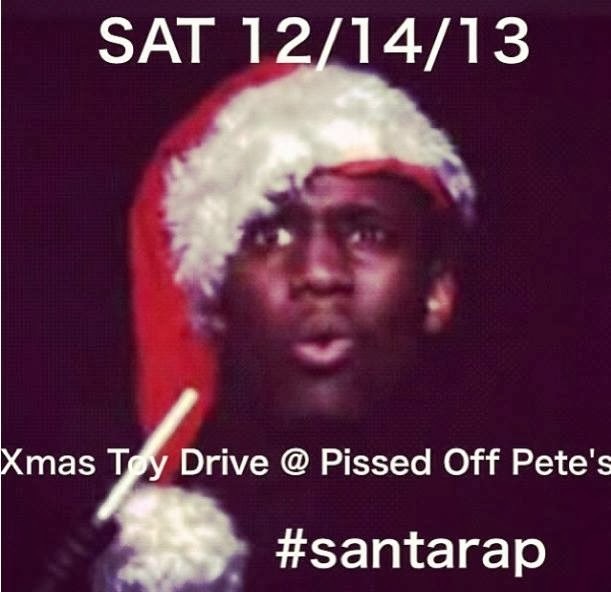 It'll be a Christmas toy drive! It will be a fun night of music for a good cause. Please bring a new toy to donate if you can and we'll make sure it gets to a child who will be very grateful. All good music. All good fun. All good. 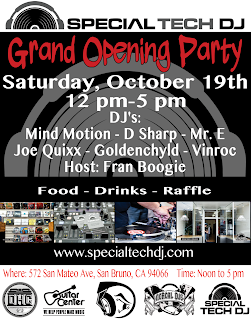 Special Tech DJ will be celebrating its grand opening on Saturday, October 19, 12pm-5pm. 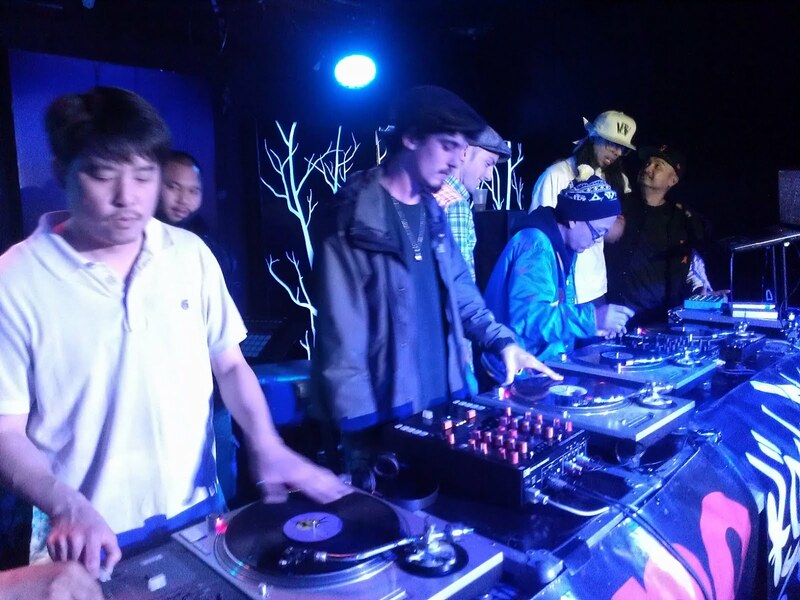 The party will feature guest DJs Mind Motion, D-Sharp, Mr. E, Joe Quixx, Goldenchyld, and Vinroc! The event will be hosted by Fran Boogie! 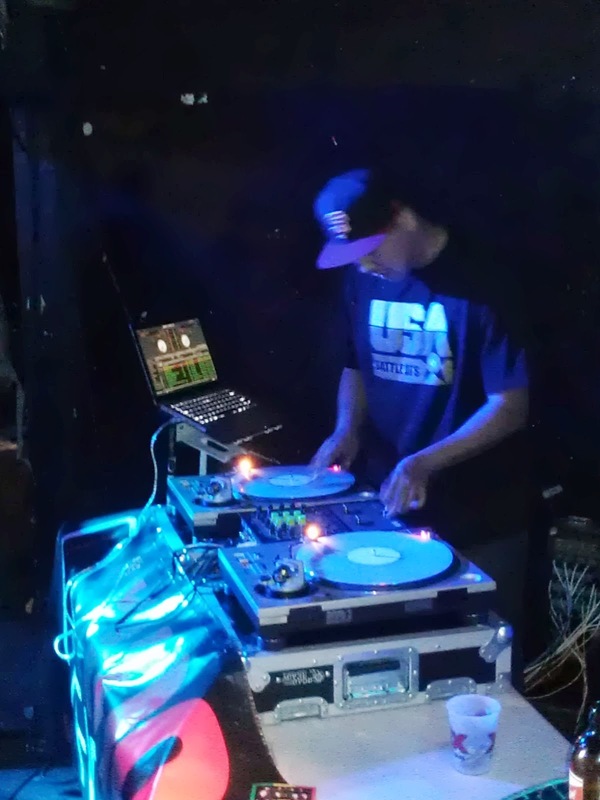 DJ Pone will also be on hand, along with fellow DJ instructor Mista B, to answer any questions you have about DJ classes at Special Tech! Special Tech DJ is a record shop, DJ school, and computer repair shop all in one. Special Tech DJ is located in San Bruno, California (just south of San Francisco). 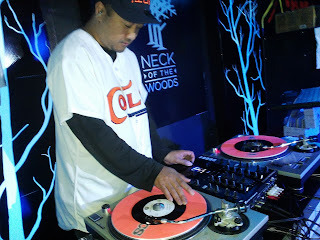 DJ Cue, who helped keep vinyl alive throughout the 1990s at his shop Cue's Records, is back in 2013 with Special Tech DJ! 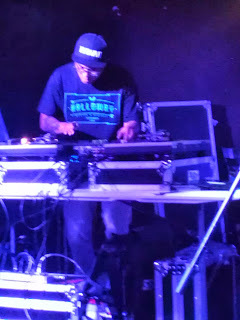 DJ Cue has assembled a great team of individuals to work together and provide a place of music, technology, and education. Read the story in URB Magazine! Check it out this weekend! 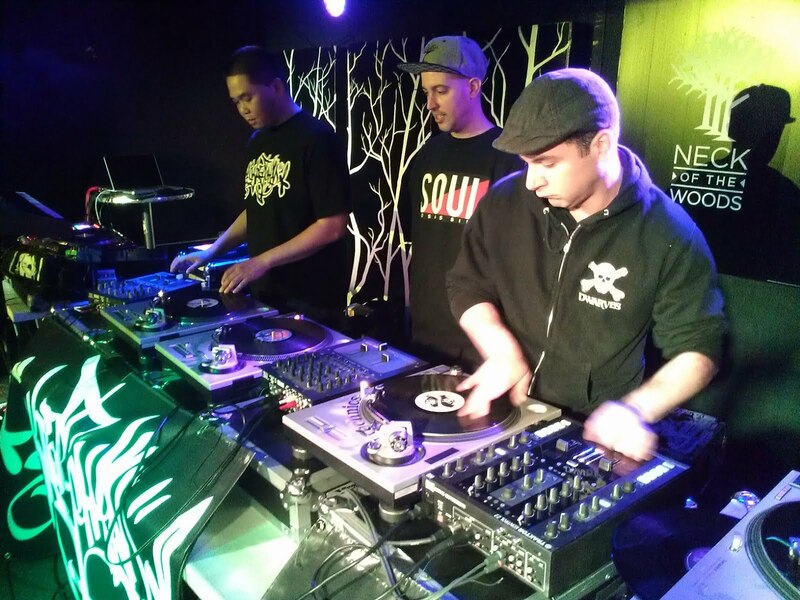 Skratchpad Crew to present DJ Workshop at H.E.L.L.A. Hip Hop Conference, Sat., Sept. 28! The Skratchpad crew (including DJ Pone) will be presenting a DJ Workshop at the H.E.L.L.A. Hip Hop Conference on Saturday, September 28, at Skyline Senior High School in Oakland, California. H.E.L.L.A. 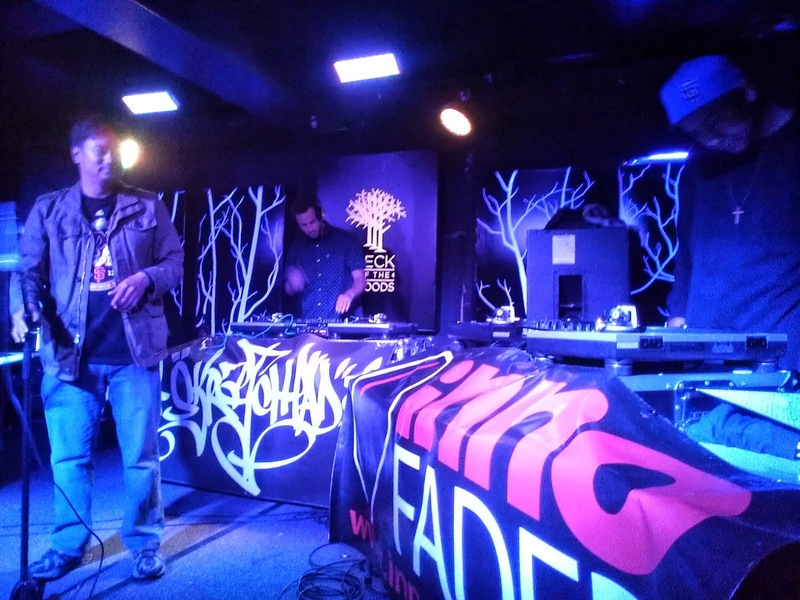 (Helping Everyone Live Life Artistically) is a 1-day Hip Hop Conference geared towards: education, celebration, and community. 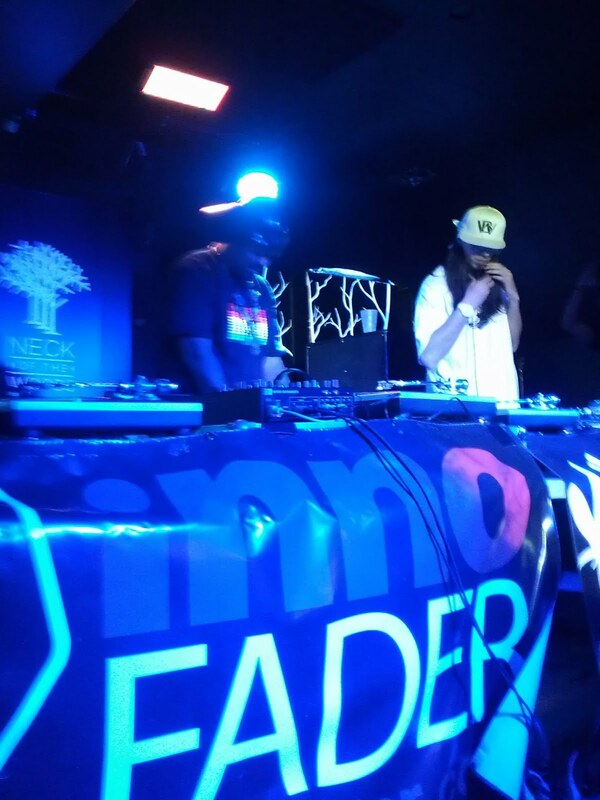 The goal is to educate our youth on the different aspects, lifestyles, and community impact of Hip Hop Culture. Register for the event at the H.E.L.L.A. website! 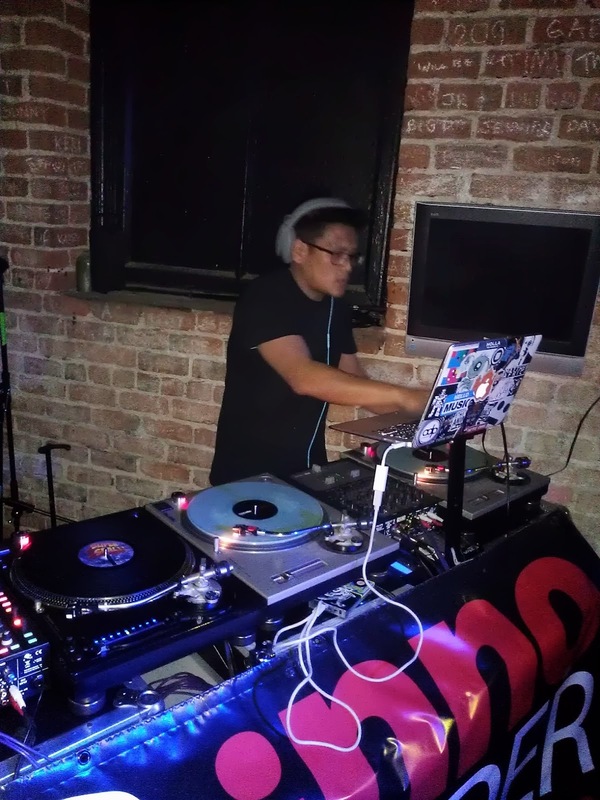 Special Tech DJ Open House on Sunday, Sept. 29! Come one, come all! Special Tech DJ is a record shop, DJ school, and computer repair shop all in one. 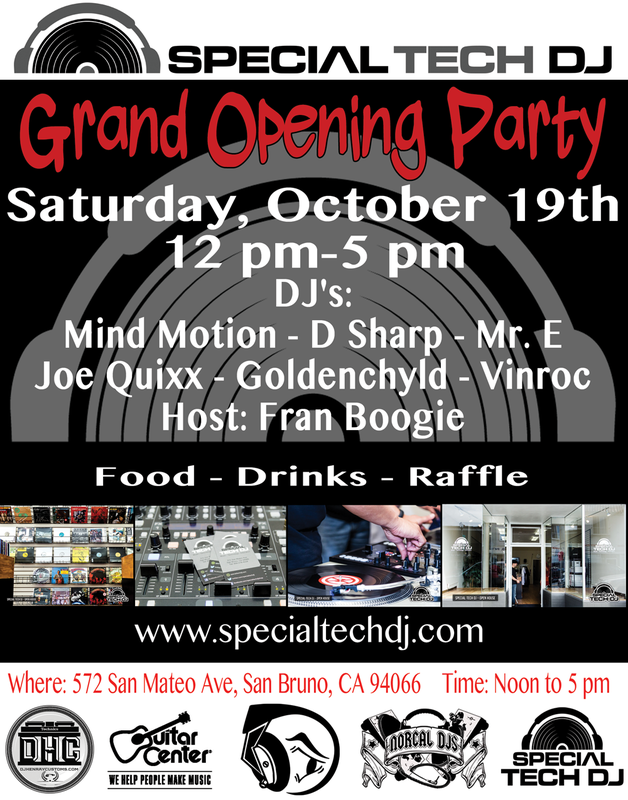 Special Tech DJ will be having an open house on Sunday, September 29 from 12pm to 5pm, in San Bruno, California (just south of San Francisco). 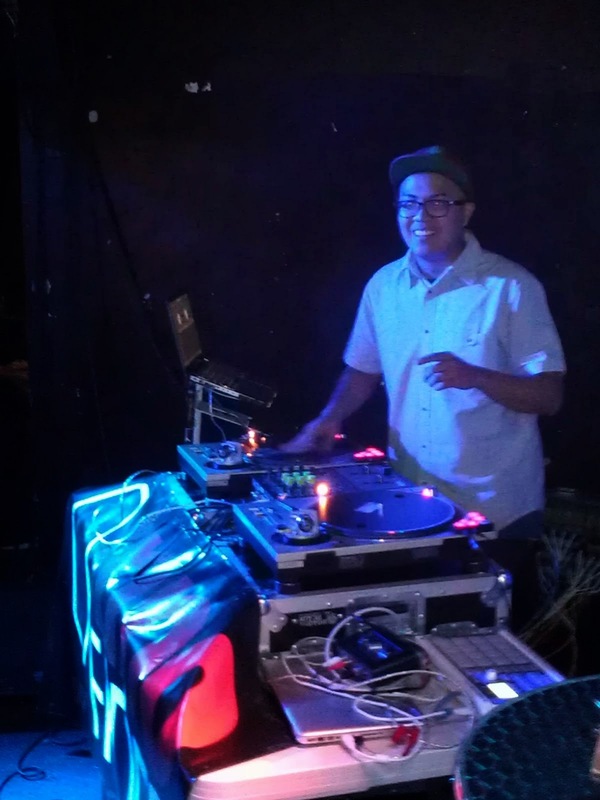 Come meet the staff, including yours truly, DJ Pone! 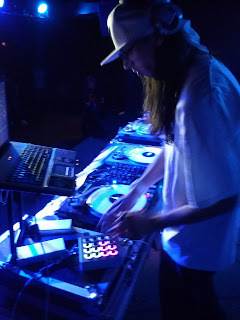 DJ Pone is on the Special Tech DJ staff as DJ instructor. DJ Cue, who helped keep vinyl alive throughout the 1990s at his shop Cue's Records, is back in 2013 with Special Tech DJ! DJ Cue has assembled a great team of individuals to work together and provide a place of music, technology, and education. 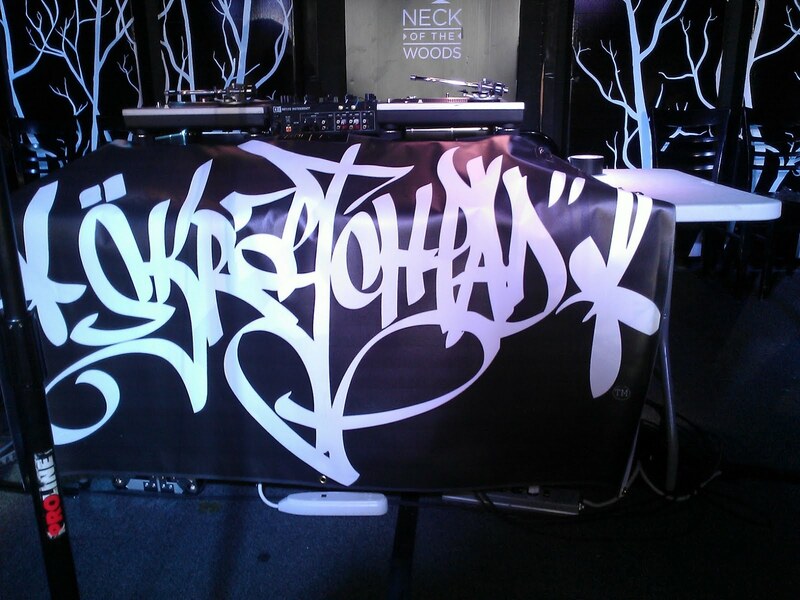 At the Skratchpad 10th Anniversary. 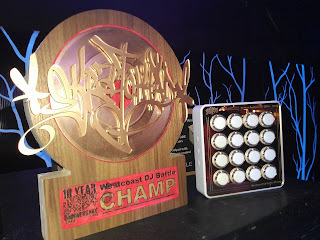 ...with Dstukt for the Skratchpad 10th Anniversary battle title. 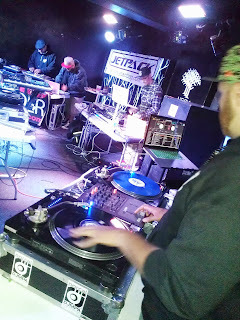 Dstrukt gets ready to break the tie in a scratchoff with Kut Khaos. ...at the Skratchpad 10th Anniversary. 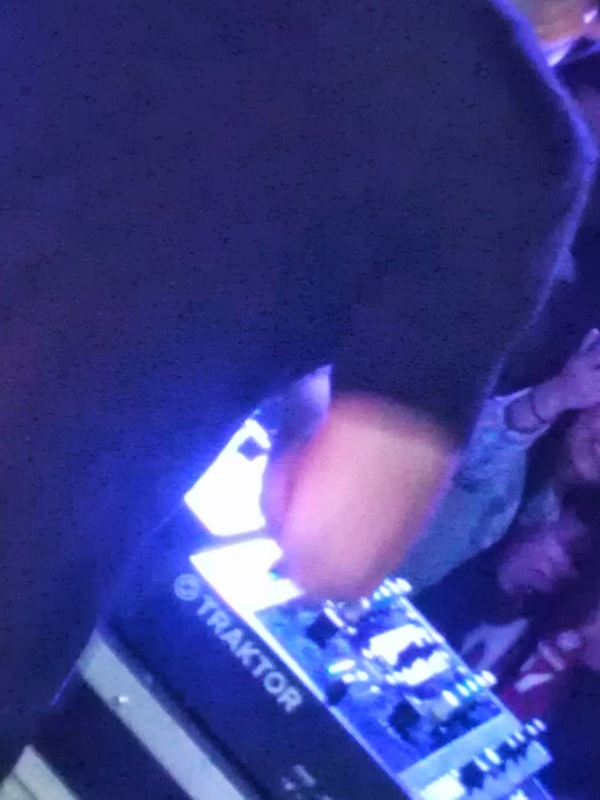 The NI Traktor Kontrol Z2. ...i'm stuck on stage behind him, but I can hear it all! Waiting for the battle to begin. ...put on your dancing shoes! 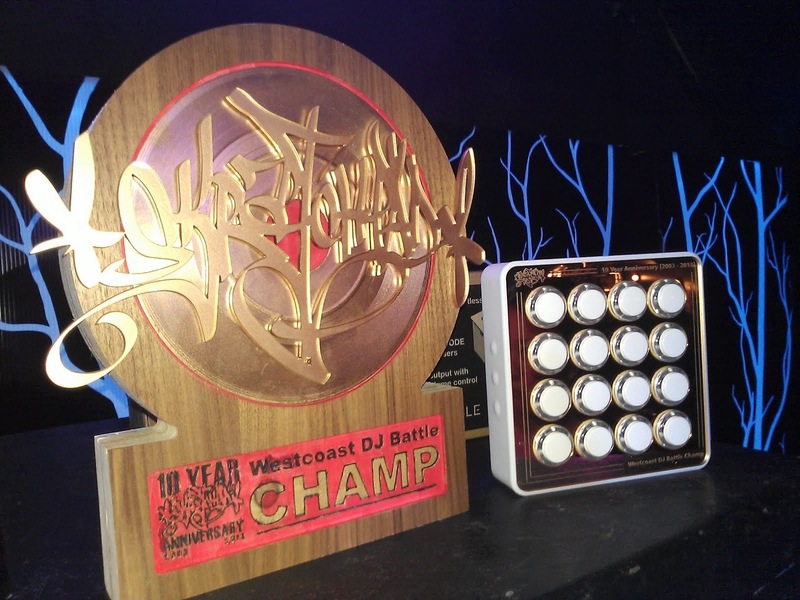 Trophy and custom MIDI Fighter for the Skratchpad 10th Anniversary battle tonight! Thanks to Mitch Manchild of DJ Techtools for the creations! No one outdoes Mitch...except for Mitch! Skratchpad 10th Anniversary - writeup by Billy Jam at Amoeba! 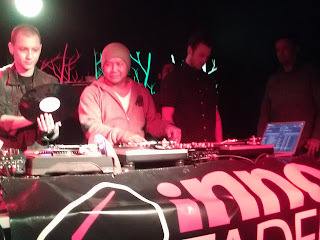 Here's Billy Jam's writeup of the Skratchpad 10th Anniversary on Amoeba Records' Amoeblog. 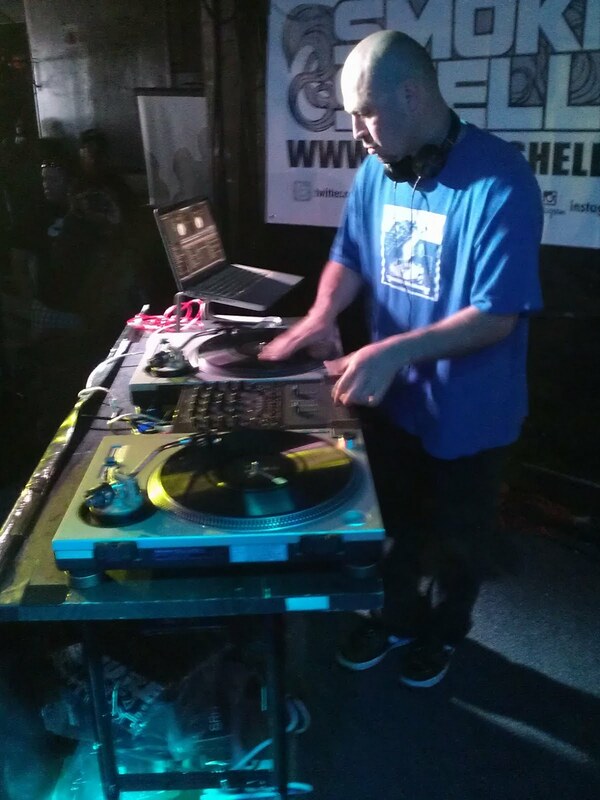 Shout out to Billy Jam of Hip Hop Slam! Thurs. 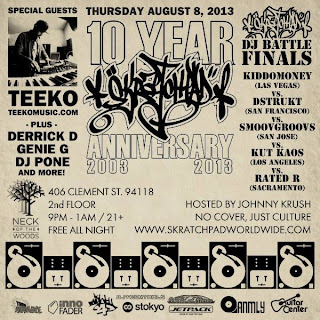 Aug 8: Skratchpad 10 Year Anniversary - DJ Battle, Performance by Teeko and More! 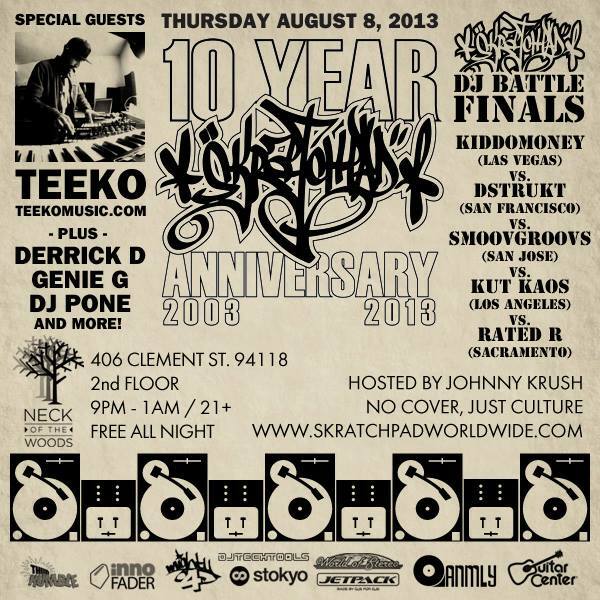 Thursday, August 8, 2013 -- SKRATCHPAD is Celebrating our 10 Year Anniversary w/ Special Guests Derrick D (OG Beat lounge), Genie G, Teeko (4OneFunk) & SP's first Westcoast DJ Final Battle Circuit! 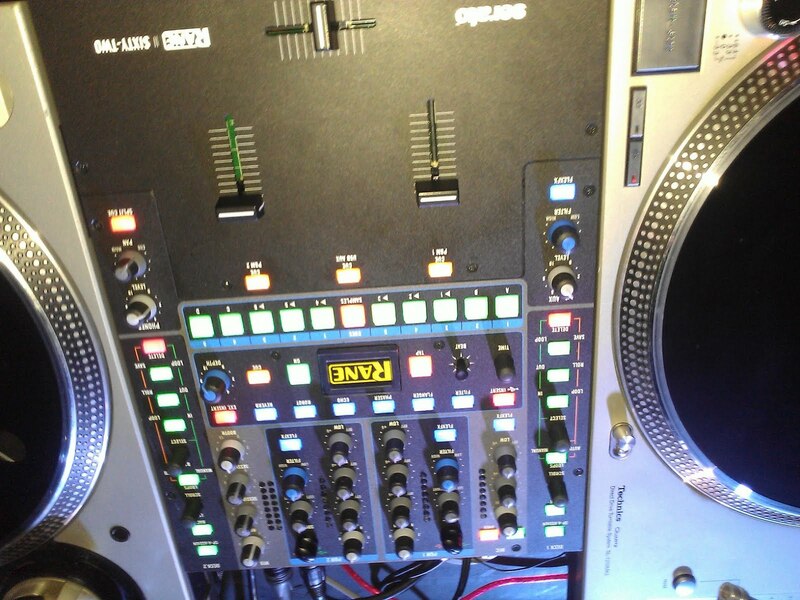 1st Place receives DJ Tech Limited Edition Thud Rumble TR-1S Mixer & Custom Midi Fighter, more prizes & Judges TBA! JOHNNY KRUSH ~ " No Cover Just Culture!" DJ FINALISTS WILL BE GOING HEAD TO HEAD - 5 MIN ROUTINE EACH! 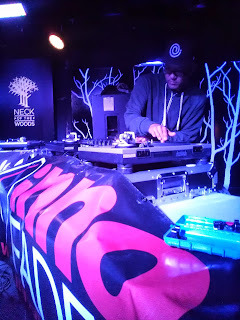 Skratchpad shout out to Hip Hop & DJ Community & Music lovers who have supported us over the years to help us keep working towards our mission: "To help preserve Hip Hop culture, elevating the art of DJing, and connecting the music, culture, & people." 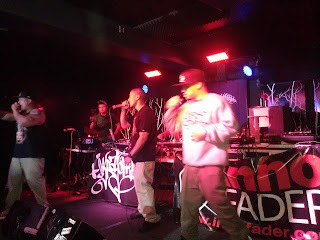 Much Love & Respect ya'll! 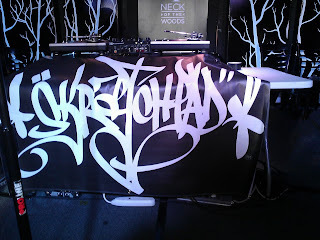 Keep it moving.... Skratchpadworldwide.com! 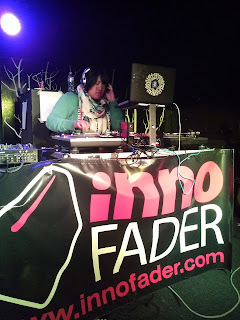 Big Shout out to all of our Sponsors: Thud Rumble, Mighty4, Stokyo, Cues, Rane, ANMLY Clothing, Innofader, BeatsbyDre, Jet Pack, Guitar Center, Mega DJ Center. 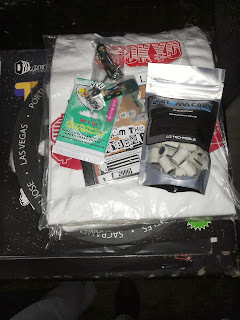 To the winner of the Skratchpad SF battle. Includes Vestax headshells, Tablecloth slipmats by Dstyles, shirts from Stokyo and Rane, Serato control records, Chromacaps from DJ Techtools, a DJ bag from Jetpack, and more. Damn, I should have entered. 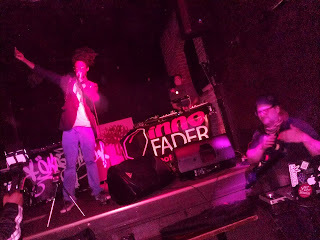 Professor Cutfresh cuts it up. DJ Dstruct the next one on the decks. 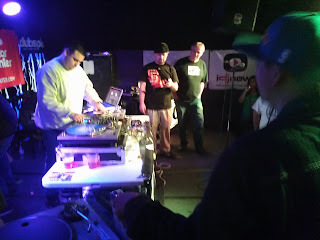 Mista B hosts while Mitch Manchild spins and DJ Bassmonkey aka DJ Traps gets ready to battle. 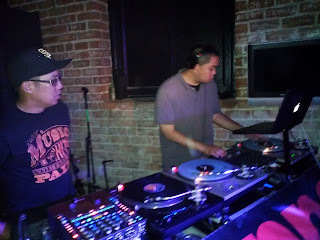 @ Skratchpad SF June 2013 edition. 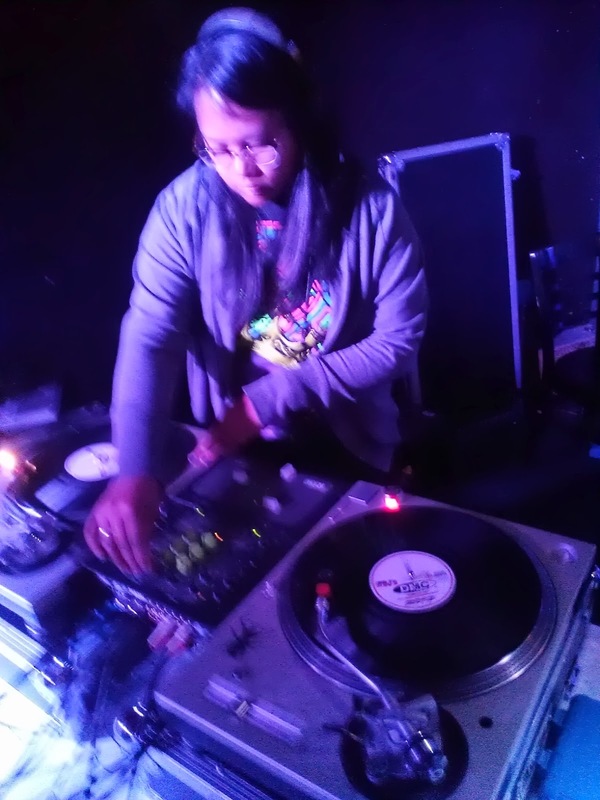 DJ Pone Cuts Up The Disco Vinyl In San Francisco this Saturday! 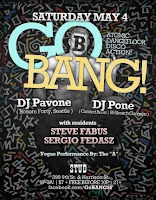 Saturday, May 4: DJ Pone joins his KALX buddy Sergio at Go BANG! in San Francisco! DJ Pone will be spinning his first ever live disco mix, which will be all-vinyl and turntablism-flavoured to boot! Go BANG! is the monthly queer-mixed, friends & family, dancer-oriented, DISCO party brought to you the first Saturday of each month by DJs Sergio Fedasz and Steve Fabus. 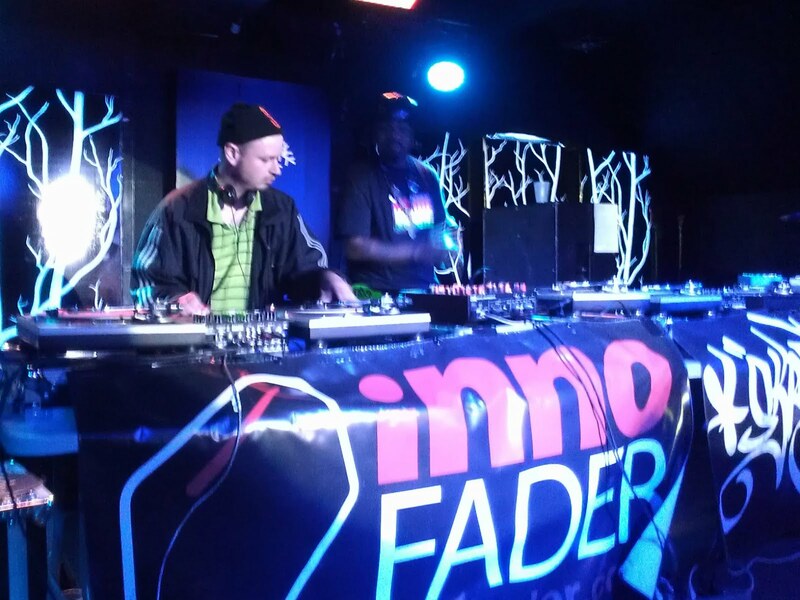 You can't beat disco and scratching. Check it out! More information on the event Facebook page. 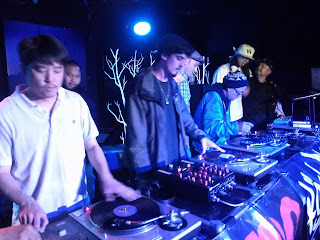 For those who didn't make it out last night, check out my homeboy Billy Jam's report on the San Francisco DMC regional DJ battle in the Amoeblog. There's a photo of me in the article! I didn't compete in the battle. I was managing the stage along with DJ Mr. B. I also jumped on the turntables for a quick second during the showcase of DJ Quest and DJ Cue, but I couldn't keep up with DJ Quest's awesomely fast electro power scratching. Congrats to DJ Traps. 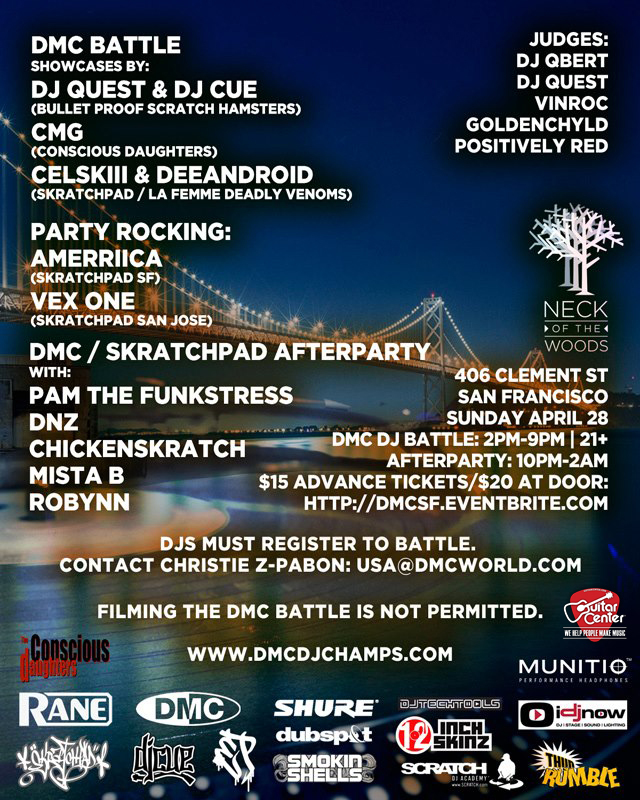 An awesome DJ to represent the SF Bay Area at DMC US Finals this year. How we do in SF. DJ Cue and DJ Quest showcase at DMC San Francisco regional DJ battle. Bulletproof Space Travelers! 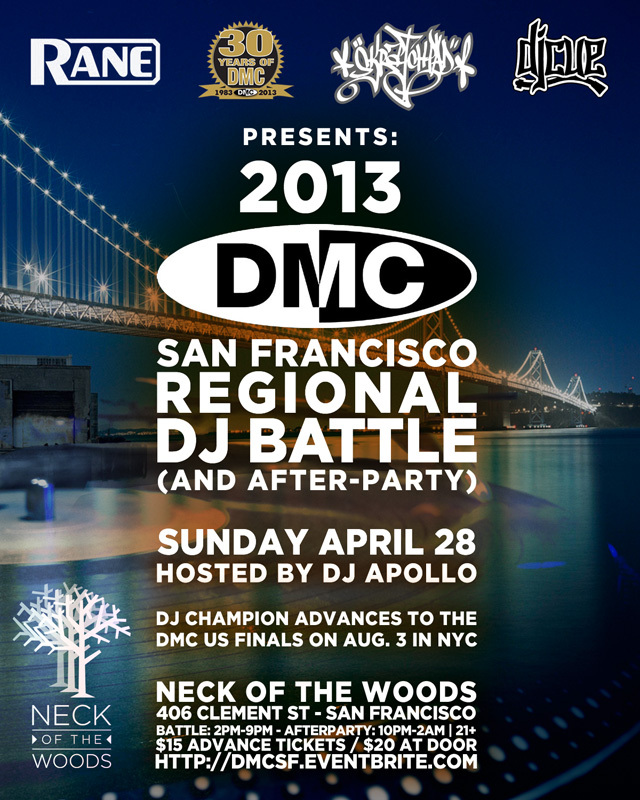 DMC San Francisco regional DJ battle! Sorry, the photo is upside down! Setting up for the DMC SF regional! 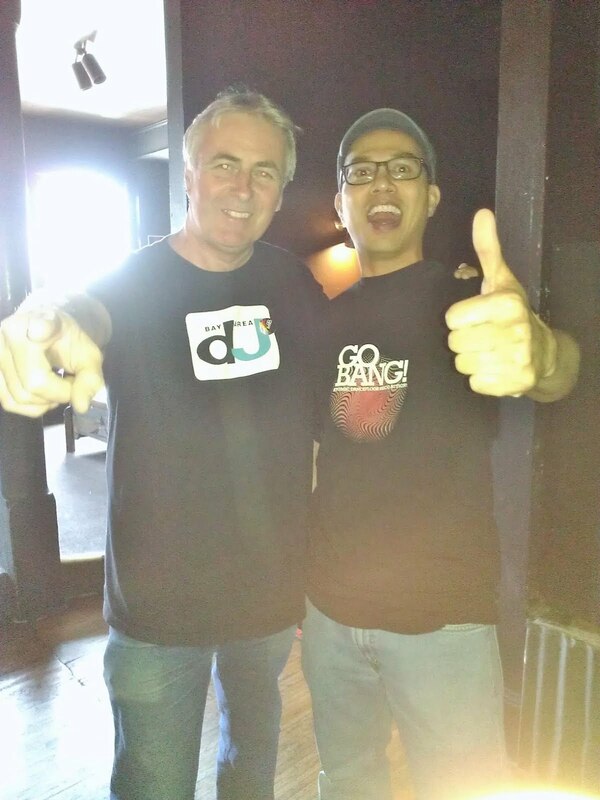 setting up for the DMC San Francisco regional DJ battle! 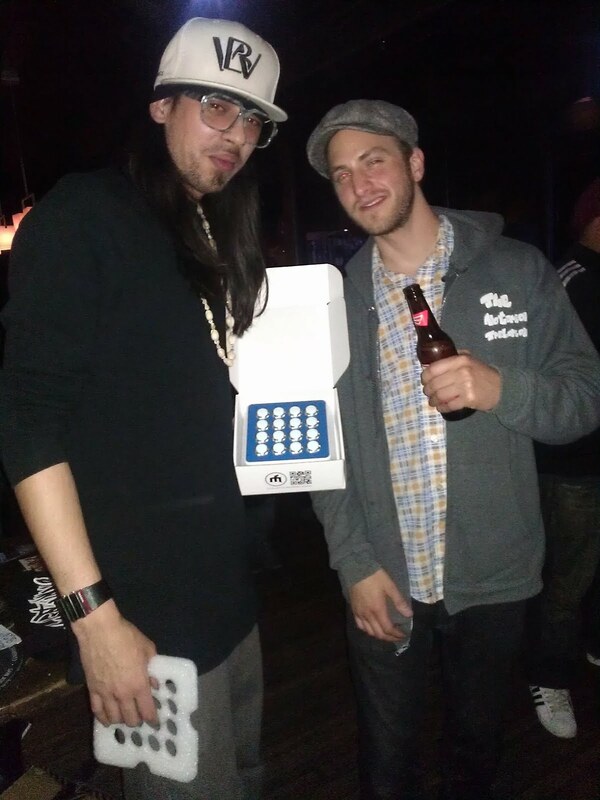 Custom MIDI Fighter Spectra for DMC San Francisco Winners..
Made by Mitch Manchild from event sponsor DJ Techtools. 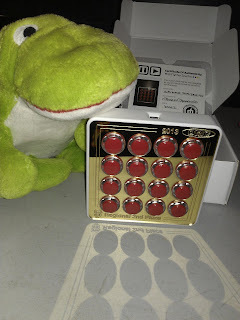 Custom engraved with the DMC logo. For first and 2nd place. 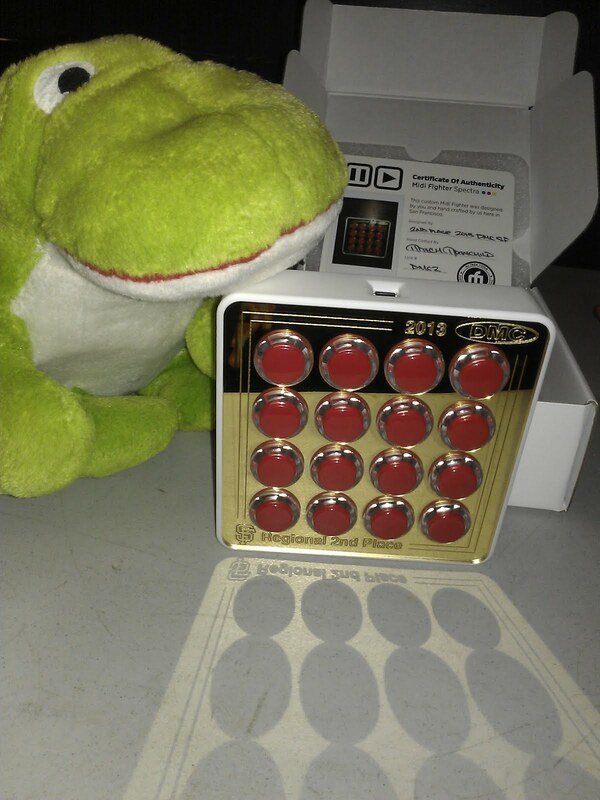 Everyone was jocking the first place one so Froggy was checking out the second place one. Last Chance to get your DMC San Francisco $15 Pre-Sale Tickets! 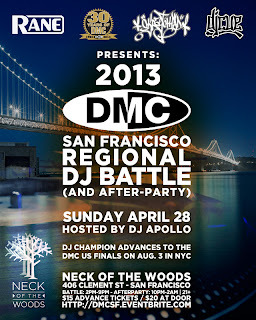 It's your last chance get your $15 pre-sale tickets for the DMC San Francisco Regional Battle at Eventbrite. Pre-sales close tonight! Admission is $20 at the door. 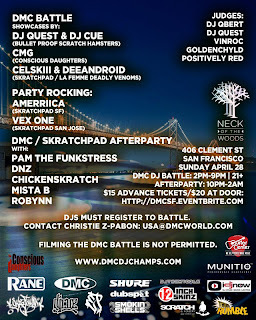 Watch some of the best turntablists in the Bay Area battle for a chance to compete in the DMC US Finals in New York City! The battle will be hosted by former DMC World champion DJ Apollo, and will feature showcases by DJ Quest & DJ Cue, CMG of the Conscious Daughters, and Deeandroid & Cellskii! DJs Vex One and Ameriica will be rocking the party throughout the day! 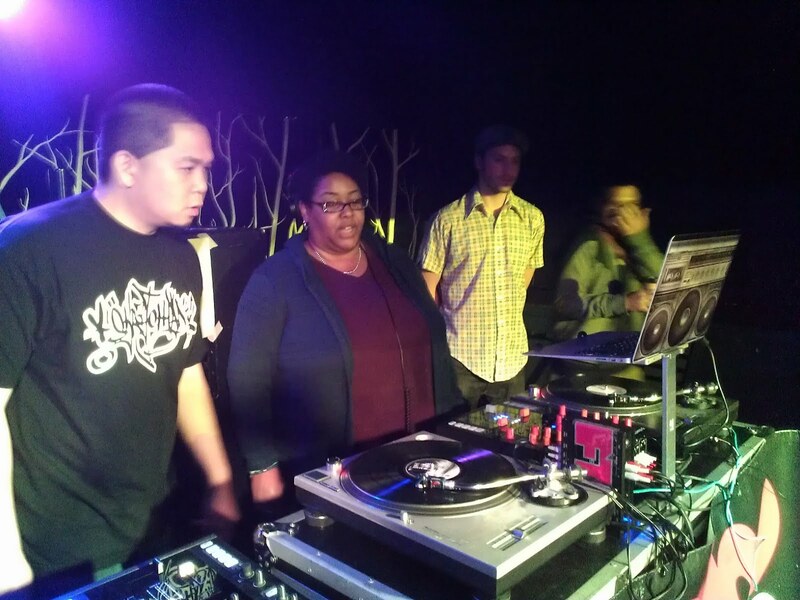 Stick around for the Skratchpad afterparty right after the battle, with open turntables to get your scratch on, as well as sets by Pam the Funkstress, DnZ, Chicken Scratch, Mista B, and DJ Robynn! For more information, check out the event Facebook page! Thanks to event sponsors Guitar Center, Munitio, DJ Techtools, Beats by Dre, and Thud Rumble; also thanks to 2013 US DMC sponsors Rane, Shure, Dubspot, iDJnow, 12 Inch Skinz, Smokin Shells, Elite Philosophy clothing, and Scratch DJ Academy! Listen to a teaser of DJ Pone cutting up the disco hip-hop breaks on Soundcloud! 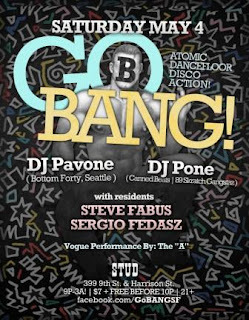 DJ Pone will be cutting up the disco breaks live on Sergio's show on KALX 90.7 FM on Monday, April 29, 8pm-9:30pm, and will be live in the mix in San Francisco at Go BANG! on Saturday, May 4! 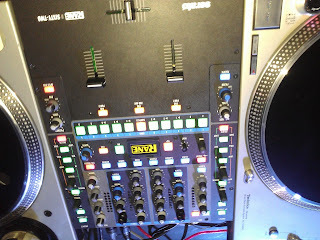 Check out djpone.com for details on the KALX live mix and Go BANG! 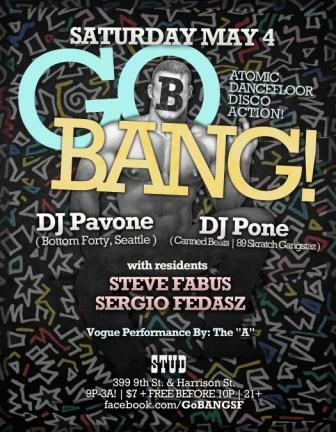 Monday, April 29: As a warm up to his turntablized disco set at Go BANG! that week, DJ Pone will be spinning a short disco hip hop breaks mix as a guest Sergio's show on KALX 90.7 FM on Monday, April 29, 8pm-9:30pm! 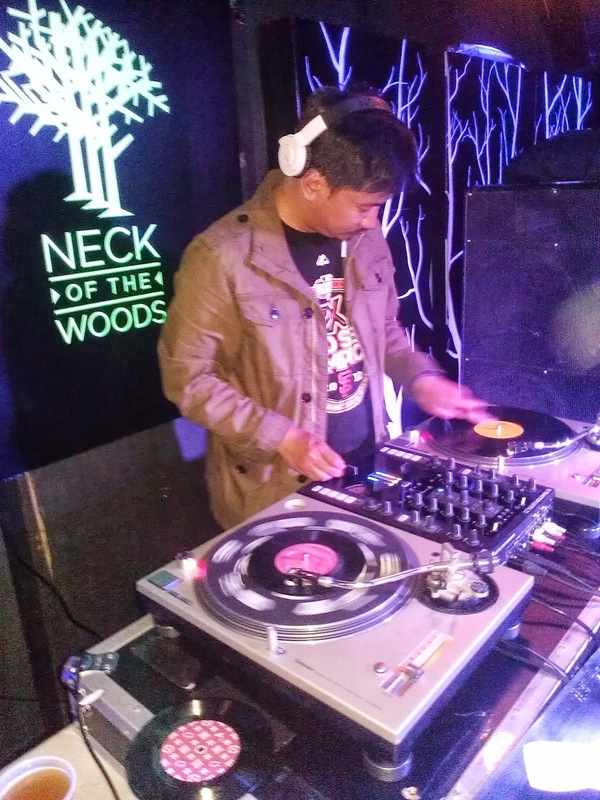 DJ Pone will be cutting up a selection of disco tracks and the corresponding hip-hop tracks that sampled them! 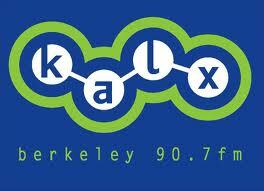 Tune in to 90.7 on your radio, or listen to the stream live on http://kalx.berkeley.edu/liveplayer.html. Geo-D, one of my AWESOME former DJ students is performing at the UC San Diego Sun God festival. Thanks for the shout out in your bio, Geo! I'm proud of you, man.
" 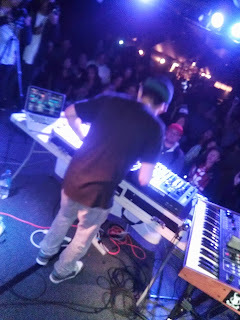 From the early age of 13, Geo-D immersed himself in turntablism with the direction of notable artists such as DJ PONE, and DJ Guzie of the Rock-It Scientists." If you're in San Diego on May 17, check it out. Especially if you're a UCSD student...other performers include Kendrick Lamar and Porter Robinson! UCSD Sun God Festival info is here. 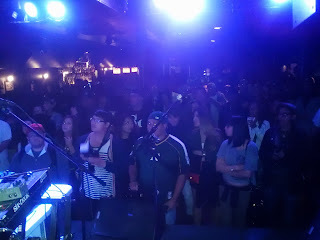 It is kind of crowded on the stage. Max Kane making music one-man-band style @ Skratchpad SF. 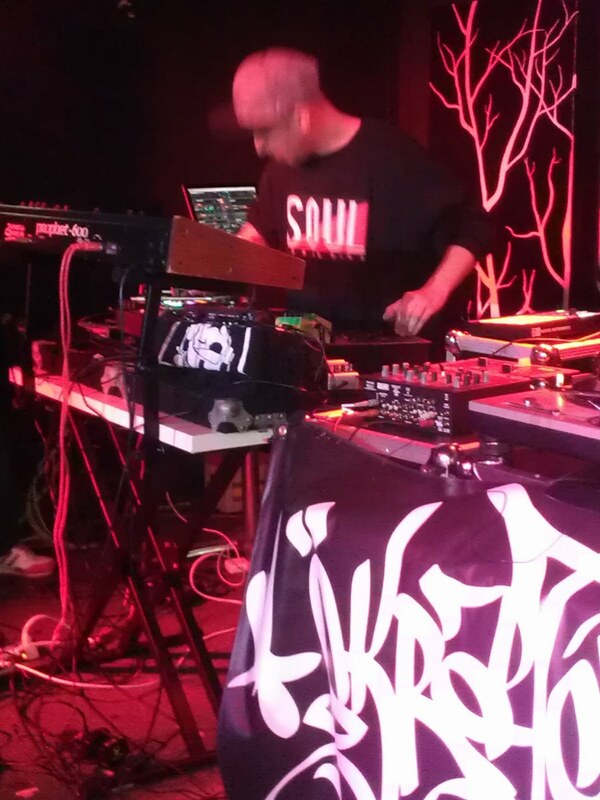 At the center of all the pedals, MIDI controllers, and other stuff is a TURNTABLE. Shout out to the 4 One Funk crew. DnZ wins the MIDI Fighter Spectra! Shout out to Mitch Manchild (pictured with DnZ) and DJ Techtools. 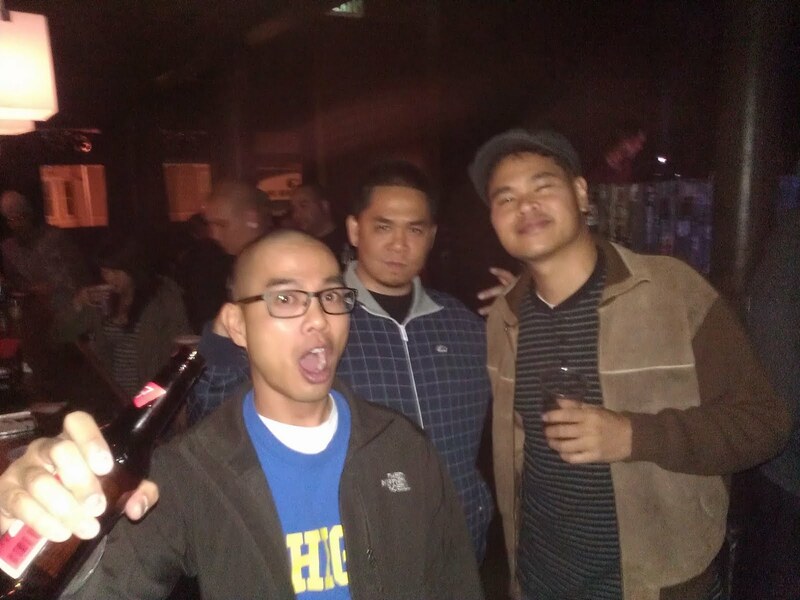 89 Skratch reunion @ Skratchpad SF!! DJ Pone will be spinning a turntablist set at NOT NEW YORK, the gallery opening event at Washburn Studio, on the evening of Saturday, April 13, 6pm-10pm. 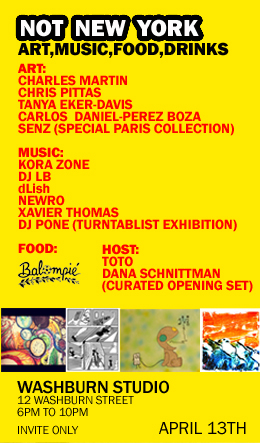 The invite-only event will showcase artwork from four upcoming local artists, with a special showing from Senz. DJ Pone will be joined on the decks by a special lineup of DJs. For more information, read the event write-up on SF Station. The event is invite-only. Contact Washburn Studios if you're interested in going: info@washburnstudio.com. Washburn Studio is an art and learning space in the SOMA District in San Francisco; DJ Pone teaches scratch classes as part of the Art of DJing lesson series offered at Washburn. Check it out! DJ Pone performs a turntablist set at the NOT NEW YORK gallery opening event. Thursday, April 13, 6pm-10pm. Invitation only. For information, email info@wasshburnstudio.com. Skratchpad SF, Thursday April 11 featuring Digital Martyrs & Max Kane! 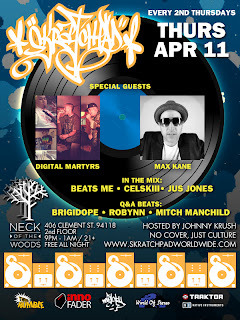 Skratchpad San Francsico April Edition: Special Guest performances by Digital Martyrs & Max Kane!!!! 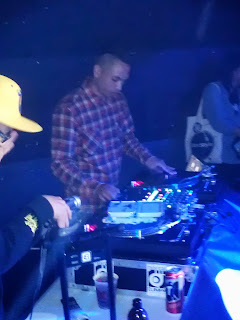 Amazing Zoo Crew will be in the house, with Brigidope & Beats Me. Plus, we'll be celebrating the Aries Birthdays: Jus Jones, Deeandroid! 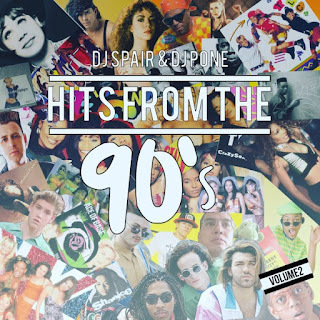 Listen to Hits From the 90s Volume 2 on Mixcloud!